Don't miss this opportunity to learn about the really new Blockchain technology. 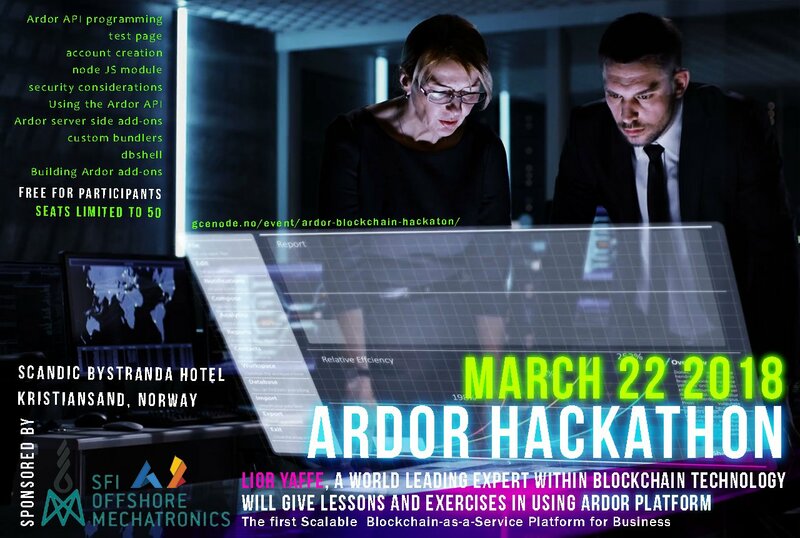 SFI Mechatronics invites you to join this Ardor Hackaton, Ardor Blockchain Platform is – The first Scalable Blockchain-as-a-Service Platform for Business. Lior Yaffe, a world – leading expert within Blockchain technology will give lessons and exercises in using Ardor blockchain technology. This technology can build trust between different business partners who cooperates without any third part for control. The technology may also be used on encrypt data which can be shared. NOTE! This event is sponsored by SFI Offshore Mechatronics and is free for the participants, but the number of seats is limited to 50.